Nasake no Onna Review: I would love for Yonekura Ryoko to audit me! Hello. This is a Korean in America. Recently, I’ve been going back to my J-drama backlog. While scrolling along the list, I saw Yonekura Ryoko’s name and decided to look at her body of work. Nasake no Onna was the one I chose to view after seeing Doctor X. Since chronologically, Nasake no Onna is earlier and both are basically in the same genre, I decided to talk about Nasake no Onna first. It is a common story in which an outsider comes into a new town or school and end up changing the existing situation. If you think about it, the whole Western genre was built on top of the common story line. In J-drama, this story line has become a genre on its own which acts to criticize current Japanese society which has become stagnated. The new entity comes in and shows people that things could change which thus leads to changes in the host environment. Let’s call it the “Extended Transfer student” genre although that terms in no somewhat outdated. Recently, the J---drama “Danda Rin ~ The Labour Standards Inspector” falls into this genre. As a K-drama watcher, it is an interesting fact that this genre has not caught on in K-dramas. Compared to either the family dramas, revenge fantasies, and even generic romances, the number of K-dramas that fall into the genre of “Danda Rin” or “Doctor X” is small. Even the ones that fall into this genre are mostly K-drama remakes of J-dramas that reduce the social commentary and add more melodrama elements such as “The Suspicious Housekeeper” or “The Queen’s classroom”. Both fall into this genre. While there is a wide variance of J-dramas that fall within this genre, it is common to have the new person being inserted into this host environment be odd enough to shock the host population and create a sense of separation from the new person and the some special ability to facilitate the change in the host population. Both are required for a good J-drama in this genre. The problem with “Danda Rin ~ The Labour Standards Inspector” is with the latter. If you have seen her resume, Yonekura Ryoko has made a career working in this genre. Before the Koshonin, she had mostly done roles in straight dramas or comedies. While Koshonin is more close to a cop drama than “Extended Transfer student” genre, there are some elements in her character than coincides with the protagonists in the “Transfer student” genre. With Monster Parent, Yonekura Ryoko entered the genre at one extreme of the spectrum. In Monster Parent, she was still more of the straight person to stagnated host environment. At the end, not only did the host population change, but she did also. This plot structure is at one extreme of the genre. The other extreme is Doctor-X in which Yonekura Ryoko plays the super doctor in the vein of the Manga “Doctor K”. It is the host population who change while the protagonist remains the same. Thus, you can see Yonekura Ryoko career as moving from along the genre’s spectrum from one extreme to the other extreme. The J-drama “Nasake no Onna” falls in between those two extremes both spectrum wise and chronically. 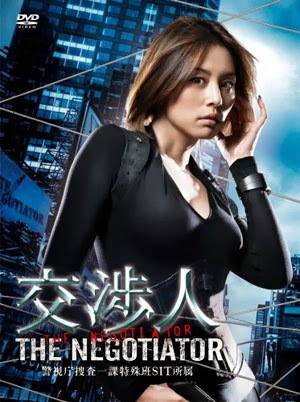 The plot follows the protagonist, Matsuko Matsudaira, a national tax investigator as she is transferred from the regional office to the Tokyo office. Matsuko Matsudaira is played by Yonekura Ryoko delivering a good performance. Yonekura Ryoko is the one the actors who can both do cosmopolitan female and a roguish tomboy at the same time with an underling layer of kindness. In Monster Parent, she did more cosmopolitan female. In “Nasake no Onna” she does both without losing the glamour and charm. As a J-drama in the “Transfer student” genre, “Nasake no Onna” is decent but not great. There are several serious problems. First, the underling philosophical theme is too shallow for the circumstance. “Nasake no Onna” is a procedural in which does around trying to capture tax evader. The series basically says that rich people should be punished because they obviously do not pay all of their taxes. However, tax is not a simple subject matter and tax evasion is not only a upper class problem. As a result of an overly simplified take on the subject matter, the episodes get repetitive after 4 episodes and this J-drama is only 8 episodes total. You have a rich person getting on the nerves of Yonekura Ryoko’ character and, then, the investigation begins all of time. Second, the host environment is not obviously stagnant or corrupt. While Yonekura Ryoko’ character is more out of the box, the people in the host environment are competent at their jobs. Since Yonekura Ryoko’ character does not have super power level capabilities in this J-drama, the contrast is not strong enough to create a sense of catharsis that this genre is famous for. Yonekura Ryoko’ character not end up changing host environment that much. While the coworkers maybe slightly more flexible, they are basically the same people they were before. In addition, as a result, the people in the host environment are not well differentiated or defined. There is no other breakout character other than our main protagonist. Yonekura Ryoko’s character is the only memorable character in the cast. This leads to the next problem. Third, Yonekura Ryoko’ character is simply not well developed. Through the series, you do get some back story about her character, but never to the degree that she moves beyond this mysterious entity. As a result, Yonekura Ryoko is not given enough character work to do even though she is in like 80% of the scenes. Whiles some actors are charismatic enough that even them reading a phone book is riveting. Yonekura Ryoko is not one of those actors. You have to give her material to work with to build and maintain the intensity that makes her shine on screen. As a result, she sometimes just blends into the many other characters in the Tokyo office and disappears. Finally, there is no real overlying payoff. There is a series wide plot that flows through the episodes regarding corruption. But it just loses steam and it the least memorable aspect of the series. Thus, the series does not deliver the final climax to audience. Overall, Nasake no Onna is not the strongest J-drama in the “Transfer student” genre. It does not seem sure what it is. There is still a strong cop drama aspect to the series which really muddles the “Transfer student” genre aspects. It’s more NPYD Blue than Law& Order: Criminal intent or even Law& Order: SVU. It lacks the punch and snazziness to deliver the cathartic release the great series in this genre delivers. However, it is still a decent J-drama with Yonekura Ryoko finding her footing in this genre and doing not so bad. It is that she is not all there yet! Streaming Link: Good drama net.